This is part 1 of a 2 part project. Find Step #2 here. If you’re like me, you’re probably into the local food movement. Eating produce that is in season, finding producers who are nearby rather than having your food shipped halfway around the world. I’m not perfect, but I try to notice where my food comes from. But what about beauty and health products? Do you have any idea where or how those are made? I certainly don’t. I try to use ‘natural’ products. But even that can mean having a natural product shipped to you from South America or some other far off location. Today we’re going to do some beginner’s foraging … and start making a super useful product from it: healing salve for bruises and sprains. In natural health shops, you’ll probably see Arnica creams and salves for healing bruises. Arnica is brilliant. But it doesn’t grow in England. What do we have growing abundantly in England that works just as well? Daisies. Daisies are everywhere. And although they’ve fallen out of fashion in the herbal medicine world, daisies were used for centuries as bruise healers. We’re going to make a daisy salve for bruises. Salves are one of the easiest herbal remedy preparations to make because it’s just oil and beeswax – no fancy ingredients or equipment. But this week we’re just going to collect the daisies and start infusing the oil. If you have kids, this would be a great project to do together. They’ll enjoy collecting the daisies, and once you have the finished salve, I’m guessing they’re the ones who would use the salve most often for bruises! If you’re taking part in Vintage Summer Camp, making this oil will get you the foraging badge. Note: As always, use common sense with this project. If you or your kids are allergic to the daisy family, this isn’t the project for you! Always test any of your homemade projects on a small patch of your inner arm and wait 24 hours to see if you have any reaction before proceeding, just in case! Collect some daisies! Ideally two big handfuls, but don’t stress out about it. Back at home, get a clean jar that’s about the same size as your amount of daisies. Ideally you want the daisies and oil to fill the jar, but again, don’t stress out about this. Just use whatever jar you have. Don’t wash the daisies first!! Any moisture in the jar might lead to mold growing (not good! ), so they need to be really dry. Put the daisies in the jar. Push down the daisies. Then pour on enough oil to cover them by about 1/2″ inch. Cover the jar and leave it in a sunny window for 2 weeks. It’s really important that the oil covers ALL of the daisies, because if some are exposed to air, they again might grow mold (still not good!). In this picture below I need to add even more oil to cover the daisies. That’s it! After 2 weeks, strain out the daisies. If you’re feeling ambitious and there are more daisies in bloom, you can go collect more daisies and put them into the same oil and infuse for another 2 weeks. This makes a double-strong oil. But don’t stress about it. In an upcoming post I’ll show you how to do the express infusion version over a double boiler in case you don’t want to wait two weeks to finish the project! Once you’ve made Daisy Infused Oil, check out the English Daisy Salve recipe here to finish the project! This project will earn you the foraging badge at Vintage Summer Camp. Summer camp runs until the end of August, come join us! Previous Post: « No garden? Give foraging a try. Yes they are daisies, exactly the same as we have in the UK. 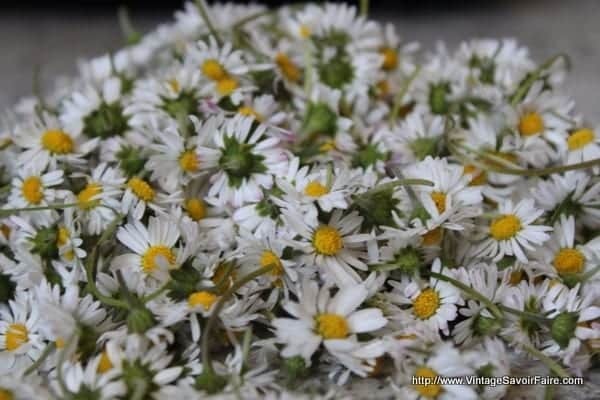 Chamomile flowers have a very rounded centre and smell appley, and have feathery leaves. Hey, I was wondering there was any special trick to the double boil option or is it just as simple as throwing the oil and daisies in a bain-marie? Hi Steve, any double boiler will work. I usually put a bowl over a pot of boiling water. You could also put the oil in a jar immersed in a couple inches of simmering water. You might want to keep a separate bowl to use for product making because sometimes its hard to clean out all the oil. Good luck! I’m into…well.. using everything I can foind in my garden and I stumbled upon this post. Hi Arianna, your borage rosemary wine sounds great, what do you use it for? You can use daisy salve or oil on the skin anytime, no problem. As with any homemade product just try it and see how it works for you! I read somewhere that wine infused with borage was used in ancient times for low spirits, nervous depression and when you need courage.. I was following this recipe after seeing the post at Crunchy Betty. I washed my daisies, but patted them dry with a paper towel. Then I used grapeseed oil for the infusion. Now, two weeks later, my oil smells kind of funky but otherwise seems okay. Did I mess it up? Or is it still okay to turn into salve? Thanks for your help! Hi Cynthia, generally I recommend not washing the daisies. Since we’re making a skin cream and not eating these flowers, they don’t need to be 100% clean. If there was still water on the daisies then it might grow mold! 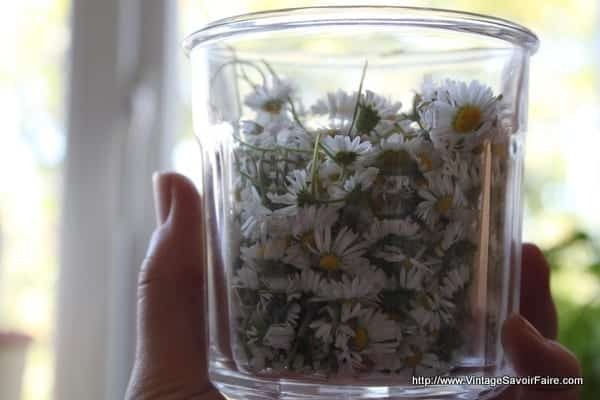 I would strain out the daisies, then make the balm and watch it carefully – if there is any sign of mold growing, throw it out. There are always more daisies to pick to try again! Thanks Amanda for answer me, about fruit. I want to make strawberry’s oil, but I think strawberries has a lot of water and I don’t know if it work mixing with oil. Maybe is better use it dry than fresh. Do you know something about? Hi Carooina, I don’t think the fruit would work because it has too much water in it. You could try dried fruit… but it depends what the purpose is. What are you trying to use it for? Do you just want the scent to use for beauty products, or you want the flavor to eat it? If it’s just for the scent, I would try essential oils – but you can’t eat those! Can I use the same method with anothers herbs, like rosemary or mint? And If I have not too much sun what can Ido, the same? put in the window or there is another method? And last question, what about fruit essential oils how can Ido, I need to dry it first, for the quantity of water they have? Yes you can use this infusion method with any herb! I would leave it in the window if you get some sunlight. If you want a faster version, you can infuse it for 30 minutes in a double-boiler over boiling water, and then strain out the herbs. I don’t understand about the fruit essential oils – could you explain? Hi Katherine, I used fresh daisies … I just meant that they can’t be damp (like, no morning dew or water on them!). If there is any water on the daisies, they might mould. So it’s best to collect them in bright sunshine (not first thing in the morning or after the rain). Sorry, meant to add–Do you think this daisy will work for the salve? I live in the NOrthwestern U. S., and I have a very tall daisy(don’t know the name, common or Latin), it gets maybe three feet high and the flower is an inch to two inches in diameter. Hi Lilah, are the flowers purple? If so you might have an echinacea! I don’t know really since I’m from the east coast and now in London. Do you have any green thumbed friends you could ask? Readers? Curious what kind of daisies you use- I don’t see a botanical/latin name, and these are tiny! The daisies we have here are much bigger, not sure if they’d work the same way or not.